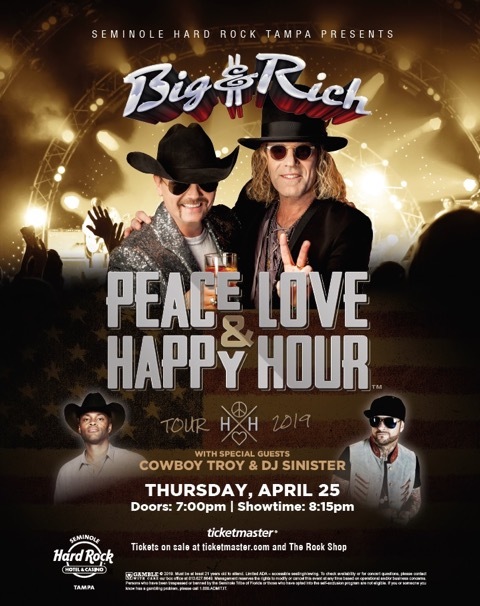 On Thursday, April 25, Seminole Hard Rock & Casino Tampa will be welcoming country music stars, Big & Rich, known for a catalog of hits such as “Save a Horse (Ride a Cowboy)” along with special guests Cowboy Troy, DJ Sinister, and Soul Circus Cowboys. Doors will open at 7:00 p.m., and the show is set to begin at 8:15 p.m. The big and rich celebration commemorates the completion of 900 new parking spaces in Seminole Hard Rock’s recently-completed Orient Road Garage expansion. This is a rare opportunity for fans to have an intimate show-going experience with the country stars. “We’re excited to officially welcome this talented musical duo who will take the stage next month for a riveting performance in front of our newly expanded Orient Road Garage,” said Steve Bonner, President of Seminole Hard Rock Hotel & Casino Tampa. The duo Big & Rich (Big Kenny Alphin and John Rich) have an undeniable influence on modern country music by never being satisfied with their craft. Nearly a decade and a half into their career, they continue to captivate a vast audience with their original songs and dazzling performances. They remain busy touring the country with 100+ dates, annually reminding fans that behind the recorded songs there are riveting performers with indisputable personality. Tickets starting at $55 are available for purchase now online via Ticketmaster and in person at the Rock Shop in Seminole Hard Rock & Casino Tampa. The concert is a 21-and-up event and will be held rain or shine. Find more events in Tampa by registering on 813area, your free local guide to everything in the Tampa Bay area!